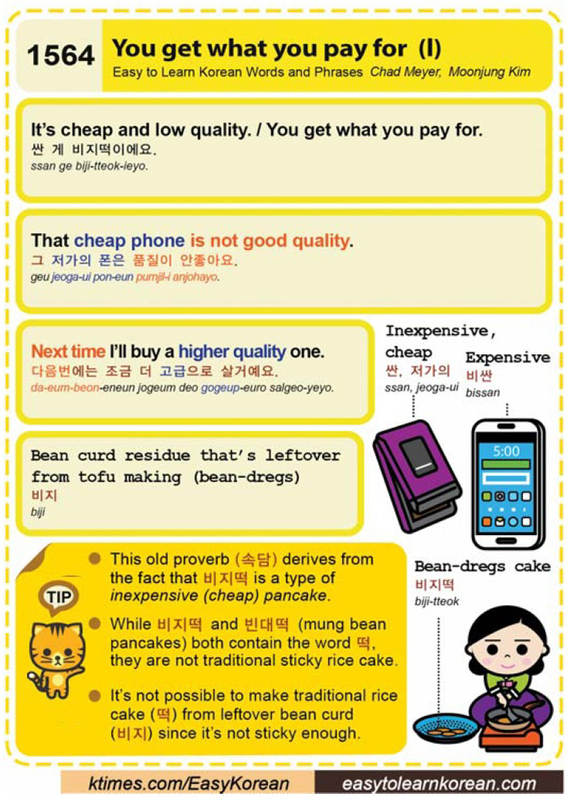 Easy to Learn Korean 1564 – You get what you pay for (part one). This entry was posted in Series and tagged Bean curd residue that’s leftover from tofu making (bean-dregs), bean-dregs cake, biji, bissan, cheap, expensive, inexpensive, It’s cheap and low quality., mung bean pancake, Next time I’ll buy the higher quality one., old proverb, pancake, ssayo, sticky, That cheap phone is not good quality., traditional rice cake, tteok, you get what you pay for, 그 저가의 폰은 품질이 안좋아요., 다음번에는 조금 더 고급으로 살거예요., 떡, 비싼, 비지, 비지떡, 빈대떡, 싼, 싼 게 비지떡이에요., 저가의 by easykorean. Bookmark the permalink.